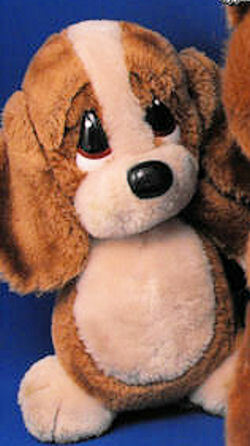 This is a photo of a Sad Sam dog that Linda says is similar to the ORANGE & WHITE Pitiful Pete dog she is looking for. I’m looking for a Pitiful Pete dog. He is bright orange with droopy ears that hang perfectly for a young child to tote, a bulbous white muzzle, short legs, and a stumpy tail. My son was born in 1977. He carried “Puff” everywhere and slept with him always. Dakin discontinued this pup sometime after that. He is now a first-time father and I would so much like to find this pup for my first grandchild. The orange & white sad dog is small. Post Code #062509-5. Anonymous one is not readable. Please send again. Post Code #062509-5. He looks like the SAD SAM Toy dog plush, if you do a search on ebay for Sad Sam you will find some brown and grey dogs that look like yours. Hope this helps! Re listed and priced even less. Or the orange dog in this lot of plushies?